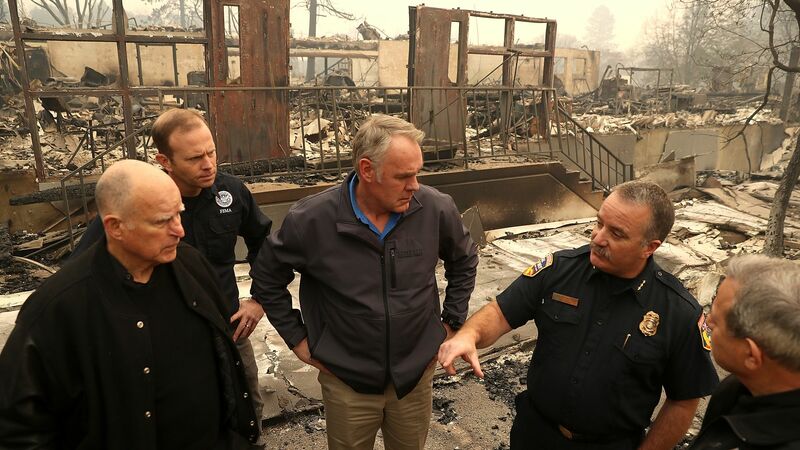 Zinke calls current forest management principles "unacceptable"
Interior Secretary Ryan Zinke called the country's current forest management principles "unsustainable and unacceptable" when speaking to reporters about California's ongoing wildfires on Tuesday. He called for more focus and funding on strategies such as thinning the forests, removing dead and dying trees, insect control and underbrush control to prevent fires. The big picture: Zinke's comments come on the back of President Trump pointing to "gross forest mismanagement" as the reason for the state's wildfire issues. California is one of the fastest-warming states in the United States. Hotter dry seasons increase evaporation, providing more fuel for fires to burn. In addition, earlier spring snowmelt and later fall rains have helped stretch the fire season to nearly year-round. These are factors that better forest management may not be able to overcome when it comes to preventing major fires.